(Describer) Beside shifting, colorful images of materials viewed through a microscope, titles: Serving society through biomedical research, and science education. Beakers and the periodic table are shown. (Describer) A light shines across green letters: HHMI. (Describer) The letters come closer, to where other titles are visible inside of them. the 2004 Holiday Lectures on Science. (Describer) Beside a graphic of DNA strands twisted with molecules and measuring tape, title: Science of Fat. This year's lectures, "The Science of Fat," will be given by Dr. Ronald Evans, Howard Hughes Medical Institute investigator at the Salk Institute for Biological Studies, and Dr. Jeffrey Friedman, Howard Hughes Medical Institute investigator at the Rockefeller University. 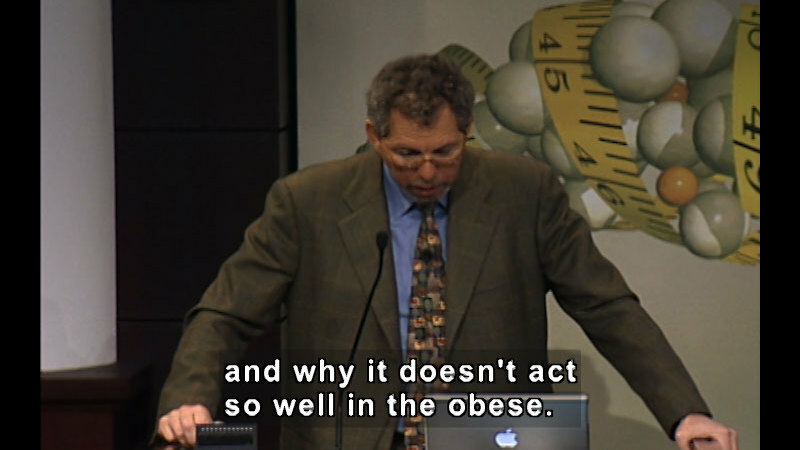 The fourth lecture is titled "Exploring Obesity... "From the Depths of the Brain to the Far Pacific." And now, to introduce our program, the grants program director of the Howard Hughes Medical Institute, Dr. Dennis Liu. Welcome back to the final presentation in this year's Holiday Lectures on Science on the science of fat. In his previous lecture, Jeff Friedman told you about a powerful hormone called leptin that was first discovered in mice and then later found to regulate body weight in humans. In this talk, Jeff is going to take us into the depths of the brain to understand how this hormone affects specific neural circuits. And it turns out that understanding these neural circuits has in turn led to the discovery of more genes and molecules that affect this tricky situation of weight balance. Then, from the depths of the brain, Jeff is going to take us out to the Far Pacific, where he's been studying a population of islanders that seem to be plagued with obesity. And he hopes to... by understanding the problem these people have, to understand better some of the evolutionary implications of obesity and also to discover new genes which in turn will hopefully give us insights to new therapies for obesity. After Jeff's lecture, HHMI president Tom Cech will return to close our talks, and as usual, we'll have a video to introduce Jeff now. (Describer) Inside a bright building with an arched atrium, Friedman sits in his office. (Describer) He confers with colleagues. and an ability to focus in on a question or a set of questions that are personally exciting and worthy of all the passion you could bring to it. I think it takes a willingness to do what it takes to address that question, you know, a certain openness intellectually to go in whatever direction the work takes you. I think it also, in modern times at least, to a large extent, takes a certain level of interpersonal skills as well. I think science, at least biology nowadays, is very often, at least at the level of a laboratory, a team effort. And then, of course, I think you have to be willing just to work hard and, you know, devote yourself to that, and to have a--I think really good science is easily described. The less verbiage it takes to describe what you did, the better the science in some ways. So, I think, you know, really good science is comprehensible if, you know, someone takes the time to explain it. You know, obviously there are technical aspects to it, and there's jargon, and there are different levels of understanding. But I think, at its core, good science addresses sets of questions that everybody can relate to, both with respect to the question itself and the answer. (Describer) He stands at the podium. (Describer) A slide shows an obese three-year-old boy and the same boy of normal size at eight years old. and it's highly instructive, I think, to just keep in mind the fact that obesity can be caused by genetic alterations and can, as you just heard, be resisted by other genetic alterations. Now, in this particular case, the genetic alteration affected the ability of this child to produce this hormone, leptin, and the importance of that hormone to the regulation of weight, it becomes immediately evident when you look at what the child looks like before and after replacement of the encoded protein. But it's also the case that only a couple of dozen children or adults worldwide have been found to be... were leptin deficient. And so while leptin plays an important physiologic role, deficiency for it is not the principal cause of human obesity. Rather, in most cases, obesity is associated with some insensitivity to leptin that impairs its ability to activate those neural circuits that regulate food intake and burn energy, in turn, also sending signals to these peripheral tissues which include, as you might expect, modulation of PPARs, described so wonderfully by Ron a moment ago. So what we'd really like to begin to understand now is how does leptin normally activate signaling pathways in the brain, and what's different about its ability to do so in the obese state? And the supposition here is from this will come a higher level of understanding, not just of what causes obesity and how we might treat it, but also how we regulate a complex behavior, keeping in mind, of course, that we are not metaphysical beings. We are composed of molecules. Well, in thinking about how leptin works, there are 2 questions-- one, how does it modulate the neurons on which it acts? And then 2, what is the nature of the neural circuit into which that neuron is wired? First question-- how does leptin act? Leptin is a class of hormones that was described for you earlier that act via what's known as a cell surface receptor. Here's leptin, the receptor. Leptin binds, changes the conformation of the receptor, and thus activates a series of downstream cellular elements, the names of which are in some of these boxes, and I'll just list them for you. There's a transcription factor that turns genes on and off known as STAT-3. There's a kinase. This is an enzyme that puts phosphates onto different proteins and regulate other proteins in so doing. And then SOCS-3 is another molecule that shuts the system off, so that the signal is not propagated indefinitely. And it turns out now in recent years, these and other signals have been shown to modulate leptin sensitivity. So, for example, mice that are missing this SOCS-3 become more leptin sensitive, and that property is also exhibited by other genes. And so one level of understanding will require that we know in great detail exactly how leptin changes the activity of the nerve cells in which it acts. And there's already reason to believe that doing so will lead to a better understanding and perhaps treatments for leptin resistance and obesity. The other question is, where does the leptin act? What are the nature of the neural circuits on which it acts? And the answer to that-- and leptin acts at a number of sites. Could you roll the tape, please? But the most prominent one is a region of the brain that I've referred to on a number of occasions known as the hypothalamus. 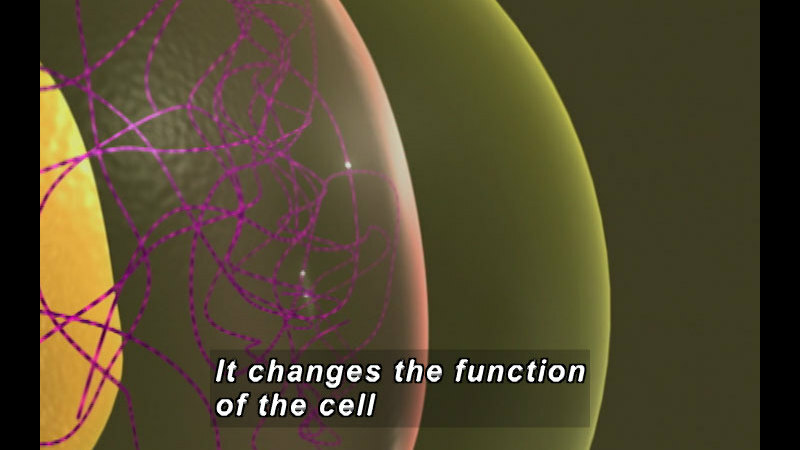 (Describer) An animation shows a mouse's brain. (Describer) A cross-section is shown. and section it here, and this is the hypothalamus, at the base of the brain, just above what's known as the optic chiasm, which is where the optic nerves cross. This is the hypothalamus. Interestingly, the hypothalamus has hardly changed at all throughout all of vertebrate evolution. So, there's a tremendous similarity of this structure in all vertebrate animals, all of whom share the same basic drives. Let's start by asking, what are some of the basic drives that the hypothalamus controls? Anybody want to hazard a guess about that? (Describer) Some hands go up. I would say appetite. OK, so it definitely includes feeding centers, and they're localized in particular nuclei here-- the ventromedial nucleus and the arcuate nucleus. The nuclei in the hypothalamus are collections of nerve cell bodies. Does it regulate thirst? Thirst is regulated there. Any others? Possibly breathing? Actually, breathing is more brain stem, but that's a reasonable guess, and I probably led you to assume it would be based on everything I said. A couple more. It's the body's thermostat. That's right. Body temperature is controlled in other nuclei in the hypothalamus. Regulates sleep. Sleep is regulated through the hypothalamus. That's correct. And... Doesn't it regulate the calcium... amounts of calcium in the bones? It can indirectly regulate bone, and I'll just give you the last answer. It actually also plays a role in regulating aspects of reproduction and sexual behavior. So the hypothalamus is the center, to a very large extent, of all of our basic drives. Now, we study feeding, and so we'd like to know more about the circuits that regulate feeding in response to leptin and other molecules. So, in the hypothalamus, you could imagine that leptin might act on nerve cells and might activate the activity of some and inhibit the activity of others. And we're actually learning a lot about what the specific neuronal classes that respond to leptin are. In one case, there's a molecule called NPY. NPY is expressed in neurons together with this receptor for leptin, and leptin inhibits the activity of these neurons. Now, normally the neurons signal electrical signals to downstream neurons that express other receptors. And ultimately, these neurons, when they fire, stimulate feeding. There's another group of neurons that express the leptin receptor and a molecule called MSH. This is the same molecule that causes pigmentation in your skin, but in the brain, it changes neural activity, again propagating an electrical signal and when these neuronal pathways fire, feeding is inhibited. So leptin acts, not surprisingly, by inhibiting pathways that stimulate feeding and activating pathways that inhibit feeding. Well, some exciting results have become evident in recent years, because it turns out that mutations in this pathway cause human obesity. And this includes not only the mutations in leptin that I told you about, but mutations in its receptor, in this MSH molecule, and the receptor for MSH, the MC4 receptor. And so single-gene mutations in any of these 4 components have been shown to cause human obesity, and in aggregate, account for 5% of morbid obesity. So 5% of the morbidly obese people in our population have a genetic alteration in a single gene, the majority of which in this pathway are actually in this MC4 receptor. That's pretty high. That's actually higher than the number of simple genetic contributors to other complex traits. Keep in mind that these are single genetic alterations. As we'll come to in the second segment, in the rest of the population, there's a combination of genes collaborating, as it were, with environment to lead to obesity. Now, I want to emphasize to you that more is known about these neural circuits, but one of the exciting prospects here is that by modulating the activity of these molecules and the neural circuits that they in turn modulate, we might be able to develop a new class of anti-obesity agents. And so a number of drug companies are engaged in trying and developing molecules that activate this receptor or inhibit these receptors. Other components of this system have been identified, including what are known as endogenous cannabinoids. And some of you may have heard that new drugs that target these endogenous cannabinoids which normally stimulate appetite, are also in development, and they're also part of this neural circuit the leptin signals through. So there's a great deal of excitement and promise, I think, in developing new classes of agents that modulate the activity of these neural circuits. Now, you might imagine that the activity of this circuit would be different in leanness versus obesity, and so that's at least a question we've set out to address-- what is different about the circuit in lean versus obese animals, at least at this stage of the endeavor. Now, in order to study this, we're going to have to look in greater detail at these NPY and alpha-MSH and other neurons, and it's here that we run into a problem. If you look at a section of the hypothalamus, as shown here, you can't tell one neuron from the next. And knowing that each of these neuronal classes have opposite effects, it's pretty important to know which neuron you're studying when you study it. And so if we were to simply look at the hypothalamus as per the previous slide and couldn't tell these neurons apart, we're going to run into difficulties interpreting our results. So we set out to solve this problem by labeling the neurons. Can anyone think of a strategy by which you might be able to mark or distinguish one neuron from the next? Maybe you could use a dye that is ingested and then it can run through the blood and you can see it. The use of dyes is actually the strategy you'd want to use, but then the challenge is, of course, to get the dye into precisely the neuron you're interested in, not the neuron you're not interested in. If the molecular compositions of the 2 molecules are different, they could use radioactive tagging in one of them or in both with different tags. Actually, that's a good idea. If you knew the different cell-surface receptors that distinguish the neurons, you could probably target them that way. One other...any other ideas? Well, I'll tell you what-- Maybe you could use a dye in those people who have a leptin deficiency, and you could use a dye to identify the nerve cell and the ones that are working and then use process of elimination to find the other different kinds. That's basically right. I think the strategy I'm going to tell you about now makes use of a particular type of dye that in this case is not a dye the way you think of it, but rather a protein that spontaneously fluoresces, and these actually come from jellyfish which fluoresce green. And you can get these jellyfish proteins in different colors, with different spectral characteristics, and so the idea was to make animals in which that dye, that protein dye, was introduced in a distinguishable way into each of the 2 neuronal classes, and the way you do that is as follows. Genes are composed of 2 segments. Part of the gene codes for the protein, but part of the gene includes DNA sequences that turn that gene on and off in the right place and at the right time. These are so-called regulatory sequences. So the idea here is, take the regulatory sequence that specifies expression of this gene and its cells and this gene and its cells, put fluorescent proteins under the control of that regulatory sequence, and inject that into embryos of mice such that DNA is now going to be carried through the germ line through development into the organism. So we did this, and here's what you get. Now this is that hypothalamus looked at under a microscope that detects fluorescence, and the MSH neurons are labeled in red, and the NPY neurons are labeled in green. Now we have something we can study. And so what we wanted to do is use this tool, this ability now to study each of the neurons independently to ask... how does leptin actually work on these different neurons? And the first experiment was to ask, what's different about these neurons and their activity with and without leptin? Now let's think again-- what would happen if leptin were missing? Well, you'd no longer be inhibiting these neurons. They'd be activated, and feeding would increase. And you would no longer be activating these neurons, and that would decrease the inhibitory effect on feeding and in both cases, feeding would increase. So how is leptin going to change the activity of these neurons? Well, there are 2 general possibilities. One would be that it could directly affect the electrical firing of those neurons, and that was actually what we thought would happen, but there's another possibility that I'm going to tell you about. It turns out to be an important component, which is that leptin could change the wiring of those neurons, remembering that these neurons get inputs from other neurons, and to a very large extent, it's the composition of those inputs that regulate the activity of the cells. So I'm going to show you a video to tell you what Shirley actually found when she did this experiment by counting synapses to tell us about what the inputs to these neurons are. So the NPY neurons normally get some excitatory and some inhibitory inputs. (Describer) ...in a wild-type mouse. (Describer) ..in an obese mouse. and in the POMC neurons that express MSH and that repress feeding, you have fewer excitatory inputs. So you compare ob to wild type, and what you begin to see is the wiring diagram is different in ways that would favor activation of NPY and disfavor activation of the neurons that express POMC, the precursor of MSH. So now the question is, what happens when you give leptin? Well, you rewire the brain, it turns out, very quickly, removing the excitatory inputs to the neurons that increase feeding and adding excitatory inputs to the neurons that suppress feeding. These, I should mention again, are the MSH neurons. So, what do we have? We have an ob mouse, like those animals there. We give them leptin, and in a very short time frame, you rewire the synaptic inputs to those neurons. Now, this was a rather novel and surprising result because it wasn't thought that there would be so much what's known as plasticity underlying the function of this circuit. And this has important implications that I'll come to, the first being is that the effect that we observe is very rapid. This rewiring that's evident by counting synaptic connections, occurs within 6 hours at a time frame before there's any change in behavior. We believe this would indicate that it underlies the behavioral change that we're studying. And I also want to point out that the effects of leptin on these neurons are reciprocal. So it's changing the inputs in opposite directions, and this further justifies the need to label and study the neurons individually because if we'd not gone to the trouble of labeling them independently, the effect would have averaged out, and we wouldn't have seen anything. So a really exciting question now is, what's the mechanism of this? How does a molecule change synaptic configuration with that level of rapidity? And that's something we want to understand more about. Now, another issue that emerges from this is the following. I mean, think about a plumbing system and flow through it. You could change flow through the plumbing system either by inserting a valve to change the flow, or you could add new pipe and change the flow. And we have just made the simple assumption that leptin was going to act by changing the flow, by changing switches as it were. It's a less parsimonious explanation to suggest the laying down of new pipe, but it turns out that's a lot of how leptin works on these neurons. It acts by adding new pipe. What does that mean? Now we need to understand the broader wiring diagram. It's not going to be enough to study how leptin acts on the cell. We're going to have to understand the wiring diagram that it's integrated into and in particular understand is the wiring diagram different in the lean and the obese? Are the different drives to eat driven to some extent by more or less excitatory versus inhibitory inputs to these key neurons that we're interested in studying? So, how are we going to get at this? Well, we need to understand what the wiring diagram is, which further means we need to know where do these neurons get their inputs from, and where do they send their outputs to? Now, this leads us into very complex terrain. It leads us into the area of complex motivational behaviors. Now, complex motivational behavior has a very specific term, and it's distinguishable from a different type of response or behavior, which is a reflex. Can anyone tell me what the definition of a reflex is? (Describer) Titles: "A method that would make it possible to inject one neuron with a substance that would clearly stain all the neurons connected to it and no others would be invaluable.” Scientific American, 1979.
and he also has been interested in neural pathways and so laid out the importance of trying to find a means of staining all neurons connected to one another. In order to do this, our laboratory made use of herpes viruses. These are DNA viruses that are only propagated across connected neurons, but there's a problem with this, and that is, if we just injected this virus into the hypothalamus, all the neurons would be infected. So the challenge was to develop a virus strain that can be only activated in specific neurons, and this was done by using a particular enzyme known as CRE-recombinase as a key. What was constructed was a viral strain that is inert, that is inactive because of a sequence that's been inserted that can be removed by this CRE-recombinase. So the scheme goes something like this. We can insert CRE into the leptin receptor neurons in the same way as we inserted these fluorescent proteins. If we now use that virus to infect these animals, it's only activated in these neurons, so it will light up that neuron. The virus is called Bartha 2001, and all the connected neurons light up. That experiment was done, and it worked. And so what we're mapping here are... where are the neural inputs to these hypothalamic neurons that sense leptin signals? So where are the chains of connect-- where is the information coming from? Well, you follow over time and ask, "Where does the virus appear?" And the first place it appears, after the experiment is done, is within the hypothalamus itself. There are neurons that are regulating one another there. You wait a little longer, where does the virus go? To the amygdala, the region of the brain that controls emotion. Wait a little longer, pyriform cortex, the region of the brain that controls smell. And finally it propagates to higher cortical centers that are the mouse equivalent of centers that control what might be volition. (Describer) He returns to the factors of feeding. So, what does this mean? All these factors or all these regions appear to be talking to one another. So the leptin centers are receiving signals from other relevant centers. And another key question is gonna be do these other centers receive signals from the leptin neurons? And so what's beginning to emerge is that there's a distributed system here that processes this information, that's going to create a lot of challenges that I think are going to be soluble using the sorts of methods I told you about. Overall, we have a really wonderful opportunity, I think, here to study a complex behavior because we have a defined input in the form of leptin, a discrete number of responding cells leading to a measurable behavioral output. And I think the challenge for us and many others thinking about this field is to find out what happens in between, the idea being that this will, in time, explain more about how complex behaviors are regulated and have an impact on new therapies. In addition, I think this is going to be a way to think about how brain centers that represent the conscious wish to lose weight interact with basic drives and leave perhaps some people to be better able to resist the hunger signals than others. So I'll stop here. I think this is a chance to take a few questions from any of you. I don't think we have much time for too many questions. I'm still a bit confused about how you isolated these 2 neurons--POMC and NPY. And one of the stated reasons--or methods was finding people who were deficient in leptin or are obese and therefore they have less leptin, but these pathways are also the root cause of these issues. So it seems like you're using conclusion to figure out a cause, and I just don't know how you're able to separate the two from the beginning. You have a hypothesis about the existence of 2 neurons, 2 different types of neurons. How are you able to distinguish them? How are you able to separate something and use phosphorescence to mark them? So the original observation was that if you give leptin to an animal, you change the level of expression of these genes, and then by other assays, you could show that neurons that express those genes were changing in other ways. But the key experiment was to have a hypothesis that these are neurons that are going to respond and then label them so we could test it directly, and we tested that in other ways that I didn't tell you about. So you're right. There was only an inference that these would be responding neurons at the start, but that allowed us to generate a hypothesis that you could test only when you label them in the way that we did. (Describer) He tosses a t-shirt. OK, I think I'll take one more question. I was wondering, have you found any connection between skin pigmentation and inhibiting feeding? There are connections between those in particular strains of animals that affect MSH expression in all places, and in those animals--they are hypopigmented and obese-- no equivalent mutations, however, have been found in humans like that... although the individuals who were deficient for MSH, who are obese, are also hypopigmented, but I don't think in the general population there's any connection of that sort. (Describer) He throws another shirt. (Describer) Title: War on Obesity, Not the Obese. Jonathan Alter, a Newsweek correspondent, commented on a radio show that Bill Richardson was not a viable candidate because he was overweight and thought to lack discipline. A U.S. Representative, William Sensenbrenner, said to the obese, "Look in the mirror because you're the one to blame." In Stockholm, a Swedish court ordered a 5-year-old child removed from her parents because they couldn't stop her from eating. You know that a similar case took place in London, England? A child was about to be removed from her parents, and it was found that child actually had a mutation in the leptin receptor. It's a fact that obese people make less money and are less likely to be promoted than their counterparts. And this has led an opera singer who was fired for being too heavy, Deborah Voight, to say that "This attitude towards the heavy people is the last bastion of open discrimination in our society." And so I want to close with an opinion and then take a poll that's perhaps a little bit loaded and simply say that there's a tendency in our culture to blame the victim. I think that there are many reasons to do science, but one of them is to learn more about who we are and what makes our differences evident. And I think that's the case clearly for obesity. So let's close with a poll. Do you think it's fair to stigmatize the obese? (Describer) 87 percent vote no. OK. Well, you're young, and I think that changing views is gonna have to start with people of your generation, because other views become deeply inculcated. But I think that it's always worth keeping in mind that image of the child from England whenever you see someone who is, perhaps, in your estimation overweight. And finally, I want to let you know that a talk like this is not just about me. There are a large number of people who did the research, collaboratively in my group, who I didn't have time to mention. I'd like to thank them and all of you and would be happy to take a few additional questions. OK.
What are the disadvantages of studying an isolated population? And keeping those in mind, do you think that these disadvantages affect the validity of your study? (Describer) She gets a shirt. That's actually a very subtle and good question. There are good things about an isolated population and bad things from a genetics point of view. From a genetic point of view, there's less complexity. And in a time where things are so complicated, and there are so many genes and so many possibilities, reducing complexity is a good thing. I mean, the ultimate of that, in a way, is the mice. 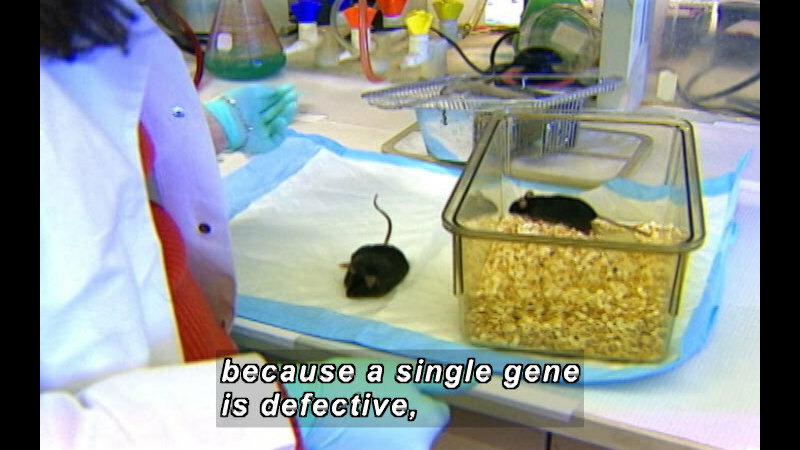 The mice--those obese mice are very genetically uncomplex, and that gave us some opportunities. On the other hand, you don't get to sample the broad palate of human variation. But you have to remember, this is a worldwide effort, and the notion here is that by understanding the genes that are relevant on Kosrae, it gets put into a worldwide database of other variants, and then time will give us a rather broad picture, I think, of what the genes that cause obesity are. (Describer) He points to another student. Is there any special benefits for the Kosrae people of this research? So the question was, is there any benefit to the Kosraens. Well, I was careful to emphasize to you that this was a collaboration with the population. And we worked with them to try to make sure that they could reap some benefits from the study. The main one is this. On that population-- in that population, treating diseases when they develop is often a lot more difficult than it is to prevent them. And so by working with them, their medical staff, and their nurses, they were able to assemble databases that allow them to decide who's at the most risk and try to intervene a little earlier, at a time where it's perhaps easier to treat the condition. The Kosrae population are also our partners in other ways, including any commercial opportunities that might come out of this research. Someone in the back? How many injections of leptin does a person need before they start to see results? And how long after the treatment is stopped would you start to see weight gain again? OK, so if you want to use leptin as a therapeutic, you actually have to inject it with standard leptin once a day. And it has to be an injection, because if you were to ingest it, it would get degraded in your stomach and wouldn't work. 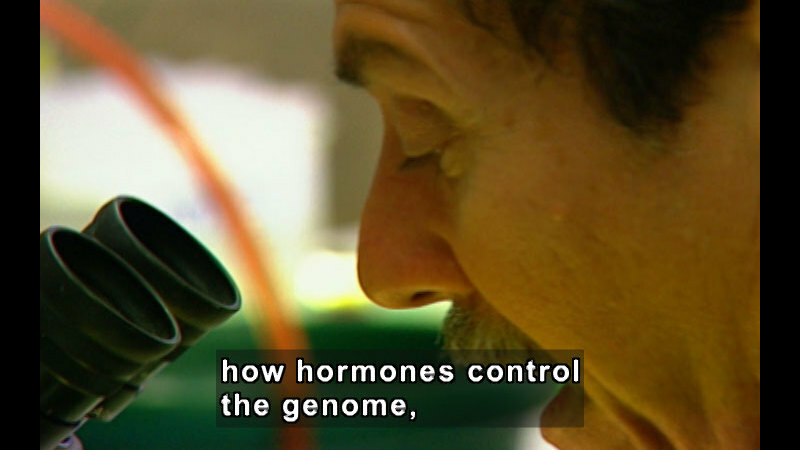 There are newer versions you can make using molecular biology tools these days that make hormones longer lived. And there are actually some formulations, I think, that can last a week or more. And, again, they're being explored. The other thing you have to remember is, if you stop the leptin, weight goes back to where it started. So the injections would have to continue. I want to emphasize now that this response, however, is not evident in everybody. Some people respond. Some don't. And that's what drives a lot of the research I've been telling you about. (Describer) He tosses a t-shirt, which misses, but she gets it. I understand that with morbid obesity there can be leptin resistance, but is the opposite possible, like maybe with people who are anorexic, they have leptin oversensitivity? Because how else--how could a person starve themself without the, um... biological drive to eat overcoming that? So you're asking-- one side of the coin is obesity. You're asking about extreme leanness. So, you're right. The causes of extreme leanness could be that you're hypersensitive to leptin. It could also be that you overproduce leptin, and there are examples of that, actually, in some animal strains. But with respect specifically to anorexia, I want to remind you that feeding for all of us is some amalgam of higher cognitive or conscious wishes and basic drive. A lot of what drives anorexia are these higher cognitive inputs that somehow are able to shut off the drive to appetite. But the situation with respect to leptin is a little more interesting than that. It turns out that anorectics make more leptin in some cases than you would predict based on the amount of fat they have. In addition, when girls with anorexia nervosa are re-fed, their leptin level goes up more briskly than would be the case for the average person. So my analysis, or the analysis of the people who've done these studies, is that hypersecretion of leptin is a permissive factor for the development of anorexia. It doesn't cause it, but it may allow those individuals who have the psychological drive to eat less to actually pull it off. The individuals who might not have that feature just aren't able to pull it off. I think, unfortunately, we have time for only one more question. (Describer) He throws a shirt, which falls at the girl's feet. OK. Let's see, who hasn't asked one yet? You. Do you believe there could be a connection between depression and leptin activity in the body? So the question is connections between depression and leptin. Well, all these centers talk to each other. And there's no question that depression can actually affect food intake. In real depression, actually, food intake goes down. So that's yet another case. We have emotional factors integrating with the basic drive to eat, and for some period of time, depressed indiv-- that overrides the drive to eat. So I think that is yet another case where the challenge is gonna be to understand how these different inputs are cobbled together into a signal. But I want to emphasize again what I said yesterday. There's no correlation that I know of among the obese in general of a particular behavioral trait. I think in the same way as there's no correlations that I know of between behavioral traits and differences in height. So I think we're out of time. I want to thank you again for all your attention. (Describer) He throws the last shirt as the students applaud. (Describer) Cech returns to the podium. Jeff, that was a great way to close our series. I want to thank everyone who contributed to these wonderful Holiday Lectures. The audience, of course, the production staff, and especially our 2 speakers. Now, already planned for next year is a series of Holiday Lectures on the important topic of evolution. The lectures will be presented by 2 more of our HHMI investigators. Sean Carroll, from the University of Wisconsin, in Madison and David Kingsley from Stanford University. Until then, from all of us, the very best holiday season to all of you. (Describer) Titles: Interactive Polling Services: RSI Communications Incorporated. A Presentation of the Howard Hughes Medical Institute. Thomas R. Cech, Ph.D., President. Produced for Sutherland Media Productions Incorporated for the Howard Hughes Medical Institute. Ann DeStefano Sutherland, Producer. Michael Skehan, Technical Producer. Wally Ashby, Director. Catherine Newton, Adam Newton, Raw Sienna Digital: Series Art Direction, Graphics and Animation. We welcome your comments on the Holiday Lectures on Science. www.holidaylectures.org. Funding to purchase and make this educational program accessible was provided by the U. S. Department of Education. Contact the Department of Education by telephone at 1 800-USA-LEARN or online at www.ed.gov.